You are currently browsing the category archive for the ‘Redemption’ category. Loose lips; our Judas kiss. Beguiling words trump common sense. Laws of nature take over. Shame is exposed to the world. But where is soothing compassion? There’s no outreach, no strength. The gossip is family betrayal. When her beloved grandfather Isaac dies, Dinah must follow his final command: travel to Job’s household to marry his son. After Job’s world comes crashing down, Dinah finds herself drawn to this great man brought low. What will she risk to fight for his survival? Author Mesu Andrews weaves a heartrending story of two lives; Dinah, daughter of Jacob, and Job, wealthy servant of the Most High. I was originally drawn to this book because of it’s unique take on the two character’s stories. Who would think to introduce the shamed Dinah to the prestigious but soon-to-be-shattered Job? But Author Andrew does, and she does it skillfully. The reader can tell that Andrews did her homework on the detail she places into her character’s environment; anything ranging from specific geography to the way they prepared food in biblical times. And the story itself is very gripping. The reader can feel Job’s pain and is sorrowed by Dinah’s reputation. I wanted to cheer for them when they overcame obstacles and hug and cry with them when their pain is deepened. In fact, I was so entranced with their lives that I didn’t want to return to my own. Excellent storytelling aside, there was a few technicalities that bugged me. The characters seemed to lack much depth. I understood their concerns and joys, but I didn’t feel like I really got a glimpse at their individuality. They weren’t very unique beside the individuality of their stories. I did, however, see a decent character arc in which they matured and grew throughout the story. That said, the writing was a tad bit dramatic. The author used certain wording and exclamations that was meant to convey emotion but succeeded mostly in making her characters seem melodramatic at times. And though this made me raise a brow a few times, it was easy to ignore for the interest of the story itself. Overall, I say bravo for a gripping tale full of love, redemption, and hope. I give Love Amid the Ashes 4 out of 5 stars. 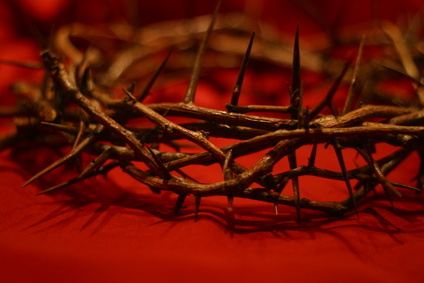 Is it possible that the crown of thorns and Paul’s thorn in the flesh are related? Is it possible that if Paul suffered a messenger of Satan, then the crown of thorns represent the suffering of Christ caused by a multitude of Satanic messengers sent to prevent His redemptive destiny? O God, to whom vengeance belongs, shine forth! Render punishment to the proud. How long will the wicked triumph? What is the cost of vengeance? Is it the death of your enemies? Oh, child. Would you like me to strike down every man who has offended your eyes, stepped on your foot? What of those who have betrayed you? Hurt you? Abused you? What is the cost of their vengeance? Day and night, my children cry out for vengeance. They know I am righteous. I am judge of good and evil. Nothing escapes my eyes. Yes, vengeance is mine. Indeed, I will repay. I will repay death as sin’s consequence. Death–the price of true offense. Who shall die? If I should exact vengeance on all who deserve, then who shall die? All those that have sinned against you, beloved child of mine. All those who have maliciously used you. All those who have stolen, lied, and wounded you. These shall die. These shall suffer. These deserve hell’s fire. For is not death and eternal damnation the weight of sin? Who, then, can be saved? Who will survive the fire of my wrath? If I should I answer every prayer that pleads for vengeance, then none would be saved. Oh, child. You do not know what you demand. For you, too, have offended. You, neither, will be spared my wrath. This is not my desire. This is not my will. What you request is devastation. The vision of it fills my Soul with mourning. I cannot bring it to pass. My love will not allow it. But righteous judgment demands it. All wrongs must be revenged. But who can stand the heat of my vengeance? None. All shall be consumed. Therefore, I sent my Son. On him, I unleashed the fire of my indignation. On him, I required recompense of every wrong committed against my children, by my children. Christ paid the cost of vengeance. And I will say, “Foolish one, because you rejected Christ‘s atonement, I find you worthy of my wrath. Every wrong you have committed against Heaven and Earth has a consequence. That consequence is death. You dare stand before the Father of the only man capable of paying this price, and say, I stand as my own defense? And there will be no answer, because none can be given. Because, whether it be through the Son of Man, or through their own demise, in the end, vengeance must and will be paid. All wrongs will be revenged. That is the judgment of God. Prayed for Redeemer of faithful believers. The tiny form of the sweet joy Jesus. Come to turn white, stains old and red. Swear allegiance to this kind, innocent pearl. Thanks to the newborn babe sent to pave our way. The howl in the wind is the cry of My children. Come. Come. Come and find Me in the quiet. Do you not hear My voice? I hear your every prayer. Do you not hear My words? I speak them–know that they are there. I am not silent, beloved children, the breathings of My heart are in response to your keening. Turn away? How can I? Forsake? It isn’t true. Do you know that I desire your affection? Is that so different from you desiring My attention? Day and night, night and day, your prayers seek my face. Brush aside? No. I embrace them. Scorn their moans? No. I weep for them. Seek me, and you will find Me. If you don’t find Me, you have not sought Me with all of your heart. I am here. I am waiting. I’m not leaving, but the days of the age are short. I am coming, with salvation in one hand, and judgment in the other. Do not wait for me to find you. For one day we will meet face-to-face, but it is better that you seek me first. Darkness consumes my vision. There is no light down here, deep in my pit—my pit of sorrow, turmoil, and despair. My hands are scraped and bleeding from trying to scale the rock walls of my prison. But the rain has made them slick. And the rocks jutting from the walls are jagged; they cut through my skin like butter. The rain mocks me. It fills my pit with water—dark water that rises above my ankles, my calves, my knees. “Help me!” I scream. Somebody is sobbing. No doubt in another pit, in another place, for another person. It is not me. I am not that weak, that vulnerable. I don’t cry. I don’t weep. The water is to my waist. The rain beats down in my face. It is hopeless. The sobbing grows louder. The water is to my chest. The rain beats harder. The water is too high. It swirls around my nose. Standing on my tiptoes, I gasp for air. I fumble around in the darkness with outreached hands, seeking anything to grasp onto, anything by which I can pull myself up. I find nothing. The sobbing is my own. Oh God, I admit it. I admit it. The sobbing is my own. I am gagging on burning liquid searing my nose and throat. Coughing, I inhale more water. I thrash about in my rain-filled pit. The water is over my head and I cannot swim. I’m going to die and there is none to help me. No one who hears me. No one who cares enough to come to my rescue. I stop fighting against my pit filled with liquid sorrow. There is no hope, so why do I care if I enter into the abyss? There is no healing balm for my broken soul. I close my eyes and I float. Higher and higher I rise, until, instead of sinking, I am floating on the surface of my sorrow. And then, I am pulled higher still and slung over shoulders that I recognize but cannot place. I blink as my savior climbs a rope ladder flung down for this purpose. And though I sway form side to side, I hold no fear of falling from his hold. The rays of sun are shining in my face, rushing heat to my shivering body. Strong hands hold me close, and I snuggle, safe and without fear, on my rescuer’s lap. And though I am soaked through, the shirt that I cling to is dry. And though my skin has bumps from the chill previously racking my body, the arms that embrace me are smooth and warm. Then, gently, so gently that I weep tears of which I am no longer ashamed, he pulls me to my feet. Loving hands remove my cold, wet clothes, article by article, with such tenderness that I do not flinch away. I stare at the ground where my bare toes sink into lush green grass. A soft cloth of fluffy cotton envelopes my body as he rubs me dry. It ruffles through my hair, which he braids down my back. And though I have yet to glance up—for I cannot bear to look anywhere but at my feet—from the corner of my eye, I see him shrug off the white robe from his body, leaving him only in a white shirt and white cotton drawstring pants. When he wraps it around my shoulders and pulls my hands through its wide sleeves, I shiver. But I am no longer cold. He rubs his fingers along the jagged cuts in my palms. Everywhere he touches my skin mends and heals. No scars remain. With a step back, he hooks a tender finger under my chin and lifts my face. I raise my eyes to curls of brown hair, bronze skin that glows with inward fire, and sweet green eyes that I instantly recognize. I step forward into the embrace of the Lover of my Soul. I cover his face with my kisses. But I refuse to let it go. I regret turning such love away. To be held in tenderness.